Homemade clamps to glue wood panels? Normally, I would buy professional tools. However, I’m planning to make desktop that will most likely be a one-time-only project. So, buying parallel clamps would not be very cost effective. I came across these homemade clamps, but I’m skeptical about how well they would work. I don’t know if they would provide sufficient pressure to properly clamp a wood panel for gluing. I see several problems with the design as it is built. The first one is the whole thing is flimsy. I like more clamping pressure than that setup can apply. Another thing is these clamps are not applying uniform pressure to the boards. For a glue-up that is as long as the one in the link, I would use at least 4 or 5 clamps instead of 2. The basic idea is a pretty good approach if it is modified. 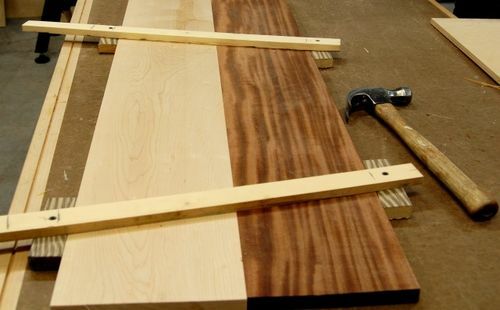 First, use 2X4s instead of thin strips. Abandon the pivoting blocks and make the clamps square instead. Glue and screw the end blocks so they will have no tendency to flex or twist. Use a pair of opposing wedges on one end of the clamp to apply pressure head on instead of at an angle. Finally, use several of them since even beefed up clamps of this type aren’t as strong as Bessey clamps or similar. I use the dual wedge approach all the time to clamp work pieces to my CNC router table. I hope this makes sense! clamping can be done with minimal pressure. you have is another matter. Yes that all makes sense. My desktop will be 72” long. I’m thinking of using 5 or 6 clamps. 2×4s would be exponentially stonger. I don’t know what kind woodworking you do, but I can’t imagine that gluing up panels is a one time thing. I’d buy the clamps. Thanks for the tip about rub joints. I’ll be using 72” boards. Would rub joints be effective at this lenght? All I do is basic carpentry around the house. But, if I were to invest in some nice clamps, I would probably find other projects where I could use the clamps. Pipe clamps are way cheaper than parallel clamps and still work very well. But are still pretty expensive if it’s really only for a single use. You can get a lot of clamping pressure from a couple of wedges. Screw two 2×4s down to your workbench or a sheet of plywood slightly further apart than the wood you want to glue up. Make wedges that are smaller than the gap. Put 2 wedges together the way you do with shims. Do this in several places along the length (the number will depend on the width of your pieces – wider pieces need fewer clamps or wedges since the force is spread out more). Pound the wedges toward each other until you get glue squeeze out along the joint. Allow the glue to dry and you’re good (you should probably protect the plywood or workbench or else your glue-up will stick to it permanently since unlike with clamps you’re gluing directly on top of the work surface). There’s always Harbor Freight. I believe their 36 inch aluminum clamps are about $12. Their 36 inch bar clamps are only $8. I’ve used the aluminum clamps on many of my projects, and they work well enough. Thanks for the tip about rub joints. I ll be using 72” boards. Would rub joints be effective at this lenght? a little persuasion is possible.